Hot Diggity…I'm knocking a few more items off my to-do list today. I decided to spend our first "real" day of winter cold indoors this morning and at my computer desk. 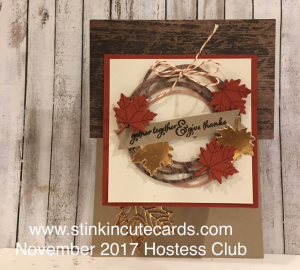 I worked to edit the last of November's Hostess Club card videos. I think this is such a fun little card and would make a cute Christmas card done in Christmas colors and add holly instead of leaves. What do you think? Can you see it too?